I hope your new year celebration has been fantastic & this year will be a greater one for you :) I've been on a pretty long "break" here as the year end break was filled with chores & activities to prepare & execute. I'm glad for the short Christmas break & am hopeful for this new year. To kick-start my blog for the year 2017, I would want to share on no other than one of Malaysian's favorite item: salted egg! Who doesn't fancy salted egg in "every other dish"? Salted egg chicken, salted egg moon cakes, salted egg croissant are some of the food items that have been infused with the fragrant, preserved salted egg. Painstakingly experimented & tasted, Shihlin Taiwan Snacks has launched their version of the Salted Egg Yolk Crispy Chicken (咸蛋超大雞排). Together with this new snack, 2 new, limited edition drinks were also launched i.e. the Taro Milk Blended (芋頭牛䑊) and Papaya Milk Blended (木瓜牛䑊). The salted egg yolk sauce is creamy, rich & has a perfect balance of savory & sweet taste that pairs well with the deep-fried XXL crispy chicken. 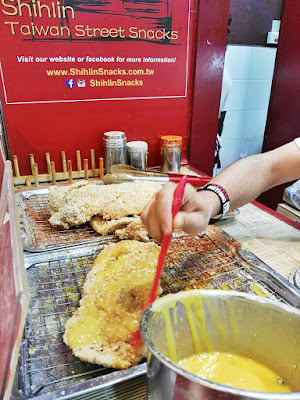 I purchased the salted egg yolk crispy chicken as take-away & thought that it would taste WAY better if you eat in at the Shihlin Taiwan Street Snack outlet itself instead of taking away. When I ordered for take-away, the crispy chicken piece is brushed with the salted egg yolk sauce before placing into the paper bag. The journey home made the piping hot crispy chicken 'sweat' & the condensation soaked the paper bag + chicken that the chicken wasn't as crispy as it was if you eat in at the outlet itself. Furthermore, the salted egg yolk sauce was brushed onto BOTH SIDES of the crispy chicken piece, so, "soaking" it in condensation definitely didn't help preserve the crispiness of the chicken. The 2 limited edition drinks were very rich & creamy as well; both felt like blended taro/papaya with milk + sweetener/syrup/sugar! I personally am not a fan of sweet, milky drinks as I'm slightly lactose intolerant. The drinks were too sweet for my liking, but I felt that it would actually do well as deep-freeze ice-creams! *lol* You can actually taste the taro/papaya bits/fibers in the milky drink, which I was pretty impressed. 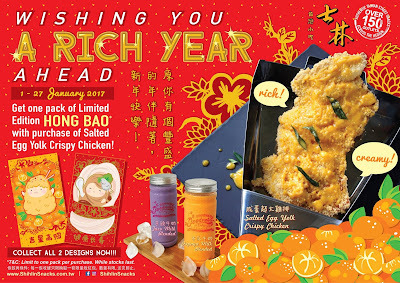 The only thing is that I'm not entirely sure if pairing the new salted egg yolk crispy chicken with either the taro or papaya milk blended drinks would be the best idea since all 3 of these new items on the menu are rich & creamy :P I guess it will all boil down to individual preference & tolerance towards rich & creamy food intake! 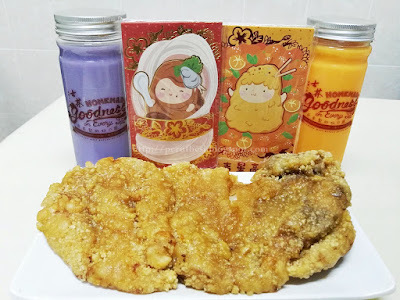 As the pioneer brand for authentic Taiwanese street snacks and now boasting more than 150 outlets across 5 different countries, this Taiwanese street snack brand features a variety of authentic favourites on their menu as well, such as the XXL Crispy Chicken, Handmade Oyster Mee Sua, Crispy Floss Egg Crepe, Seafood Tempura, Happy! Ricebox, Sweet Plum Potato Fries, Mushroom Cheese Egg Crepe and Sausage Cheese Egg Crepe. From 1st - 27th January 2017, try out the Salted Egg Yolk Crispy Chicken + either one or both Taro/Papaya Milk Blended drinks & receive a packet of cute, limited edition red packets for the upcoming Chinese New Year! Hurry, while stocks last! For more information on Shihlin Taiwan Street Snacks, please visit their website at www.ShihlinSnacks.com.tw or their Facebook at fb.com/ShihlinSnacks. New year, new hope, new list of food to try!